Maytag Commercial Coin Op 9kg Electric Heat Programmable Dryer. Go to the Richard Jay website for more info here. Maytag believes durable goods should remain just that. That’s why every Maytag dryer is constructed of the highest-quality materials and with the utmost in precision craftsmanship. Simply put, when you choose Maytag products, you ensure your peace of mind. The Maytag MDE25PD is a coin-operated electric commercial dryer. 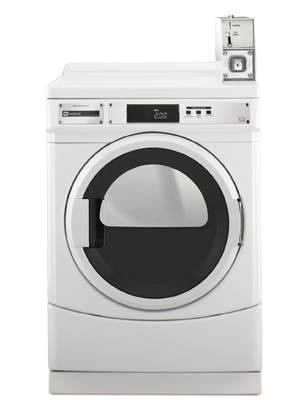 This dryer is both energy efficient and built to last, with a large 9kg capacity and that legendary Maytag dependability.